Ideal for Countersunk Square Drive Screws. SQUARE-DRIVE TAP-CAPS® press-on screw covers for your #8 "countersunk" screws with Square-Drive recesses. SQUARE-DRIVE TAP-CAPS press-on screw covers for your "countersunk" Square-Drive and Robertson screws. 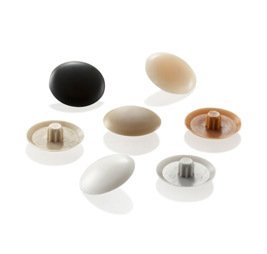 These screw covers are engineered to install easily yet hold firm by means of a friction-grip. Made from high-impact UV stabilized plastic (suitable for indoor and outdoor use). SQUARE-DRIVE TAP-CAPS Screw Covers are available in many popular colors.